A Strange Sale for Strange Times! In a couple of weeks, Monte Cook Games is launching a new Kickstarter campaign for an awesome, exclusive boxed set for The Strange. This will be an incredible box of treasures, on the model of the Exclusive Numenera Boxed Set we funded a couple of years ago. 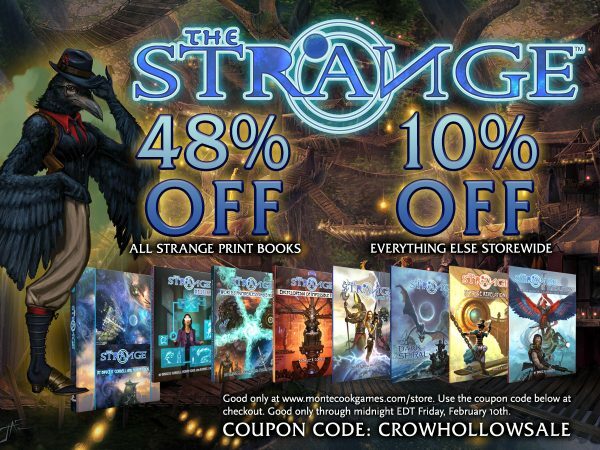 To celebrate, this week we’re holding a massive sale on The Strange (and everything else—read on). We’re calling it the Crow Hollow sale, because when recursors are looking for treasures, there’s no place like Crow Hollow. In keeping with that, you can get any print book for The Strange at an incredible 48% discount. 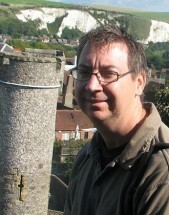 (Crow Hollow was the 48th recursion catalogued by The Estate—its official designation is R48.) To claim this discount, simply use the coupon code CrowHollowSale at checkout. To further celebrate, we’re offering every MCG product—the entire MCG Shop—at 10% off. So while you pick up a copy of Worlds Numberless and Strange and/or the Encyclopedia of Impossible Things at 48% off, you can also grab a Numenera playmat, Cypher System Rulebook bundle, hardcover of The Poison Eater, the NPC Deck, a couple of glimmers—or anything else—and save 10%. Just load up your cart and head for checkout, then click the 10% coupon you see there. And how about some charity goodness? These are indeed strange times, so we’re going a step further. 10% of all MCG Shop proceeds during the sale period will go to the ACLU. And it gets even better: For every 100 copies of The Strange corebook in print sold, we’ll increase that percentage by 5%. Not just on sales of The Strange, but on the total proceeds of the MCG Shop during the sale period. (Why are we doing this? Have a look at our recent core values statement.) So share this far and wide (you can share the graphic below): Your friends will appreciate the incredible deal, you’ll help grow the community of gamers who love and play The Strange, and we’ll all do some good along the way. And the more people who check out the sale, the more good we’ll do! But don’t delay: The sale ends Friday, February 10. And remember: Use the code CrowHollowSale at checkout.